When thoughts arise that it may be time to investigate the full time RV living lifestyle, there are lots of things that need to be considered. Are you currently full time RV living planning? It is best to plan ahead and develop a calendar of events; the things that need to get done. The timing will be different for everyone, but most of the steps will be the same! If you fail to plan, you might be planning to fail! When Pam and I started to think about retirement in an RV, it was something we knew we would want to do. 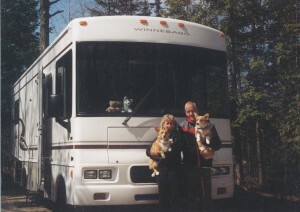 So years before actually buying the RV and embracing the lifestyle, we rented RV’s. We tried everything that was rent-able! We discovered what we liked and what we did not like! That idea is just one of the steps you could take before setting out on your journey. 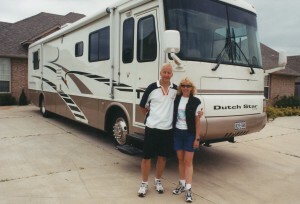 The first plan we made was to enjoy our careers, take RV vacations, and get ideas from others on the RV lifestyle. We did that for years. We started looking at RV’s back in the mid-eighties. That is when our plan started. We had a book at the time titled “Living Aboard Your RV.” I had that book for years until it became outdated by newer technologies. So, we took all our past ideas and plans, the investigation into the RV we wanted, and moved quickly. Within a few months, we had the RV purchased, the RV placed in an RV park, jobs settled, and by our nineteenth wedding anniversary, we were in our home on wheels! Did all our years of planning work? Did we choose the right RV? Did we have all the financial planning and logistics of being on the road taken care of? Because of our thirty-five thousand miles on the road before an RV purchase, we pretty much had done it right! Life went forward smoothly except for the financial downturn in 2008, but we weathered that. So, can our years of experience save you some time in your full time RV planning? I hope it can! We will share some thoughts on ways you can be prepared so you can make the right choices. We will have to break this up into a few articles because of all the things there are to consider when planning to live full time in an RV! I can’t stress this one enough! If you have never owned an RV, renting one is the best way to learn a lot of things about them. To just buy one based on limited experience, put all your stuff in it and then hit the road can be costly! We were told a recent story of a couple who found a used RV that they thought would be perfect for full timing. They visited with the owner, sat in it, took it for a drive, went home and thought about it for a day, and then came back and bought it. Their plan had come together quickly and in the excitement of buying their first RV, with no previous experience, they jumped at what they thought was a good deal and just what they wanted. So, they drove the RV home, they parked it in the driveway, set out to load their belongings aboard, and then the first of many problems started to show up! Mrs. New RVer could not fit her dishes in the kitchen cabinet. Okay no big deal, get new dishes! They sat down to enjoy their first meal in the RV and discovered that their knees knocked while trying to sit at the dinette. They also found their kitchen did not allow much room to prepare a meal. They had not considered that! No big deal, sit at an angle at the table and use the dinette table for extra cooking preparation space. Mr. and Mrs. New RVer hit the road for their first journey and more problems struck! The RV blew two tires during their trip. They were old and should have been replaced before they hit the road. No one told them that! Mr. RVer also crunched a back rear corner of the RV while navigating an RV park because he had never been taught how to properly handle his new home on wheels. It was not long after this that Mr. and Mrs. New RVer went to a dealership, and armed with a better idea of what they wanted, they traded out their RV for something more suited to the lifestyle they had hoped for. The moral of the story is, had they done more research and known what they wanted, they would have bought right the first time. It did cost Mr. and Mrs. New RVer a fair bit of cash for that mistake! But, from what we hear they are now happy! Pam and I rented from local RV dealerships that had nicer RV’s. We never did a Cruise America rental as those are lower end units and tend to be abused. That would not give a good representation of what you might buy. If you can find a unit that has just come on the rental program, it would be a good first trip! After that seek higher end units. So, please rent some RV’s and learn all you can about them! Try a Class A gas-powered RV, a Class A Diesel-powered RV, A Class C RV, and a towable unit if you can. Yes, it is not cheap, but you will save yourself in the long run and also have a great time while doing it!! Can You Live in Close Quarters? Here is another thing to consider? Can those of you that are considering living full time in an RV do that for extended periods of time without getting on each other’s nerves? In your current lifestyle, do you need time alone from each other? Imagine living in two to four hundred square feet with not too many places to hide if things go wrong. There are now RV’s that have two bedrooms. Perhaps that would work better for some than others! But will that be the class of RV you want to buy and do you want something that big? We are talking a rig that with truck and trailer could be up to sixty-five feet long. Do you want to drive that? At some point, you will have to back it into an RV space. These are things you have to consider when looking at the space you will share, or not want to share! Do you have a large close knit family? Do you currently see each other all the time? What will happen when you hit the road, and you are not around as much. Will you miss your family, your brothers or sisters, the grandkids, the grand babies? Will you be able to be there for family events when needed? You will need to have a plan for these things too! Next, once you hit the road full time in your new RV home, where are you going to call home. In the industry, and here in the United States, we call this the domicile state: the place where you claim residence. You will have to have a domicile state to receive mail, have your RV licensed, a corresponding state driver’s license, the ability to vote, an address for the IRS to communicate with you and state taxes if applicable. There is even the consideration of billing addresses for credit accounts and banking institutions. Pam and I chose Florida as our domicile state. We found a mailing service that meets the requirements of a physical address for voting and getting a driver’s license. There is also no state tax, reasonable costs for vehicle tags, and concealed weapons reciprocity in many states because I have a Florida concealed carry permit. As I said earlier, there are lots of things to consider when making your plans. We don’t want you to miss the little details! We know some fellow full-timers that used a family member’s address as their place to receive mail. Weekly, the family member would send the mail to the location that was given to them. That may work for a while but do you want to burden the family with that responsibility. What if an important document gets misplaced? That just creates additional family tension! How about any pets that you will be traveling with? Will they adapt well to the RVing lifestyle? What have they been used to? Some pets will not enjoy going from a bigger space to a smaller one. Others don’t care. How will you handle vet care as you travel to different locations? You have to have your vet records from each place you visit so the next vet will know what care has been provided before. Some simple organization will keep this aspect of full time RV living from being difficult to deal with! The Full Time RV Living Budget! What will be your budget for your new lifestyle? Will you need one? Some people have endless resources, but most of the full-timers we know have a budget. They know how much they can spend on fuel, repairs, meals, entertainment, basic necessities, and fixed costs. Sit down and write out all the regular costs you have for your lifestyle coming into full timing, and then add some expected costs that you think you will have in addition to those. You will have to include additional insurance cost for your RV, RV park fees, a travel budget, repairs and maintenance, and perhaps even funds for unexpected events like a blown tire that tears apart the underside of your RV! One of the larger expenses, as you travel about, will be your nightly campground and RV park fees. You can cut some of those costs by boondocking (living in your RV with no external hookups), but you will only be able to go so long before your fresh water tank is empty, your waste tanks are full, and you are out of fuel for the generator. Pam and I try to average twenty dollars a night for our park fees. We do that by choosing parks that offer specials, discount camping clubs like Passport America, and choosing monthly site rates. If you plan ahead and are persistent in your searches and choices, you can keep those costs between twenty and thirty dollars a night. Find a Way to Supplement Your Lifestyle! What can you do to supplement your budget if you need to? What if you want to adopt the RV lifestyle sooner? Here are some ideas! Run a business out of your RV. Also, while traveling to places you want to visit, work in campgrounds and RV parks to get a free site and perhaps some extra spending money. There are many RV parks that look for people just like Pam and me! We even get calls from them asking if we would work for them. We get those phone calls because we are members of Workamper News! Our resume resides in their online system, and we select which states employers get to see based on where we want to go. Take the financial aspect of the RV lifestyle seriously and plan accordingly. Be conservative in your estimates! We have seen several of our RVing acquaintances get removed from full time RV living because they just could not afford to do it anymore. 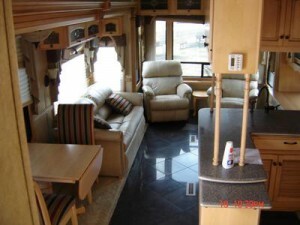 Choosing the Best RV For You! Okay, now let’s address a major issue! What kind of RV will you buy? Which one is going to be most suitable for how you plan to use it? If you have taken some trips in a rental RV or owned one in the past, this will help you with your decision when you decide to start looking for the RV you will buy. What type of RV’s are most full time RVers using? They are traveling in Class A diesel pushers, Class A gas RV’s, 5th Wheel trailers pulled by a production truck, and Travel Trailers. There are some others out there choosing other types, but these are the main choices. So how can the experience that Pam and I have with this help you out? We have traveled in all of them. We have full timed in a few of them. I can say that if your full time RV lifestyle will involve lots of travel and frequent moves, a motorized unit will make for a much better travel experience! 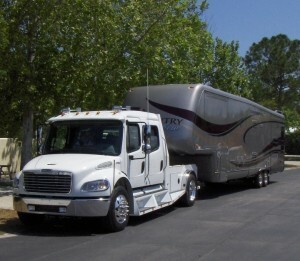 It is much easier to back up into an RV site. You may think you will only use a pull through RV sites. They are not always available, and if so they usually cost more. If your new lifestyle includes staying in one area for extended periods of time, a 5th wheel or travel trailer may be more suitable for you. They are less expensive than motorized RV’s. You can get a lot of bang for the buck. A forty foot 5th wheel is a lot like a one-bedroom condo. But, you will need a substantial truck to pull it safely, and they are not cheap. And I can tell you from experience; they can be difficult to drive and handle in certain situations. Research this choice completely before choosing a monster rig. If you have never pulled a trailer before this will take some time to learn how to do it right. Should you buy a new RV or a used RV? You can save yourself thousands to tens of thousands of dollars if you choose to find a used RV to suit your full time RV living needs. You may not get exactly the floorplan and features you think you need, but you will save money over buying a new one! When the time comes, and you are ready to put cash on the line, you can also visit an RV show if you are determined to buy a new RV! Show specials can also save you thousands of dollars, but be sure you have done your homework. Know what you want: the RV make, model and features so you will know if you are getting a good deal. Don’t forget to focus on the kitchen and bathroom areas. You need these two areas to be able to suit you! If you hit your head in the shower ceiling, that will be a problem. If you can’t sit comfortably on the toilet, that won’t work either! Think about how you are going to use your RV kitchen. Will you be able to prepare the kind of meals you like to eat? Will you be able to store the kitchen accessories you need? Remember my earlier story? Will your dishes fit in the cabinets? Before buying anything, even with some past RV rental experience, spend time in the RV looking around. Don’t impulse buy! The salesperson will want to speed up the process. Do what you can to slow it down to give you time to be sure the RV will be what you think will work for you. If you make a wrong choice there are only two things you can do, live with it or trade it in for another one. If you plan ahead and take your time, you will not be planning to fail! But wait, there will be more!! Please check out Part Two of this three-part series!